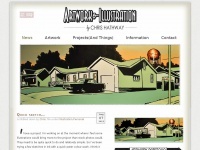 The online illustration portfolio of Chris Hathway. Chris Hathway received a BA in illustration and graphic design from Liverpool John Moores University in 1997. Since then he has been making his living as a painter, illustrator and website designer and is based in Worcestershire, England. A profile of Chrishathway.co.uk was found on the social network Twitter. The web server used by Chrishathway.co.uk is located in Houston, USA and is run by CyrusOne LLC. On this web server 12 other websites are hosted. The language of those websites is mostly english. A Nginx server hosts the websites of Chrishathway.co.uk. For managing the data of the webpages the CMS WordPress in the version 4.5.3 is used. The website uses the latest markup standard HTML 5. The website does not specify details about the inclusion of its content in search engines. For this reason the content will be included by search engines.